Mercado de San Juan in Mexico City is unlike any food market I’ve ever toured. Like most fresh markets, it offers a variety of fruits, vegetables and fresh meats. But Mercado de San Juan sets itself apart in that nearly, if not all their offerings are exotic. 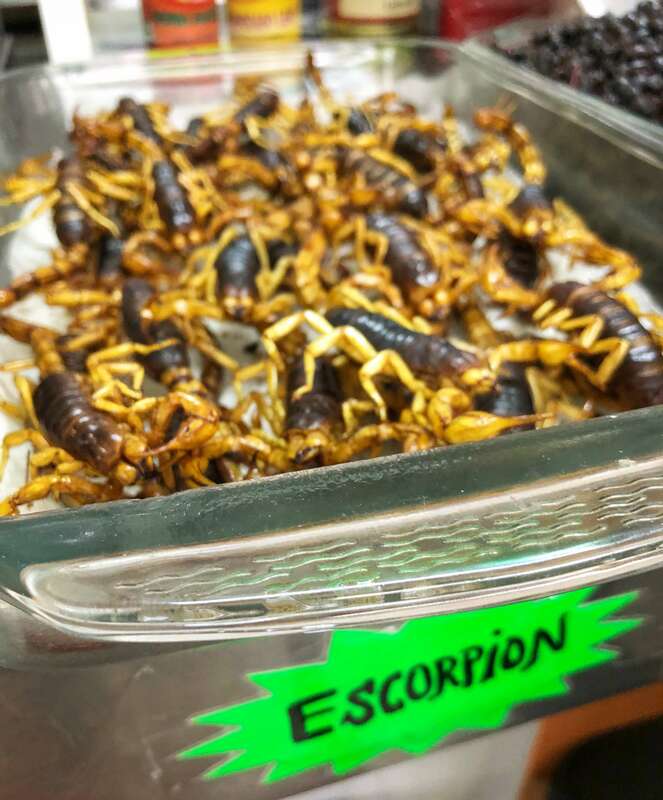 When I say exotic, I mean you can find everything from semi-exotic mangoes from the Philippines or European meats and cheeses to very exotic armadillo, crocodile, lion and tiger meat. 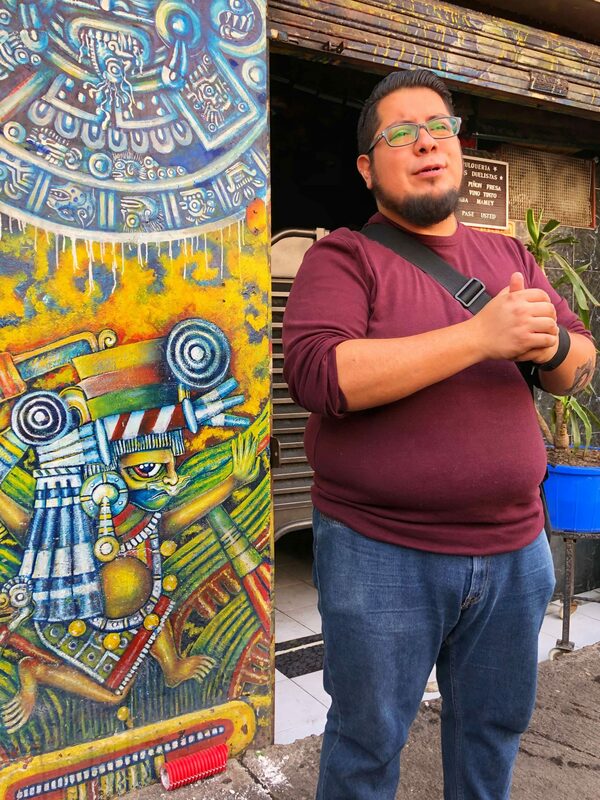 I spent the day with Eat Mexico touring not only the San Juan market, but also some of the best street food in all of Mexico City. One thing I like most about this particular company is who they hire as guides. Our guide, Adrian, is an actual chef who has worked all over the world. He really knows and loves food, and his passion and excitement when describing dishes really shined through. 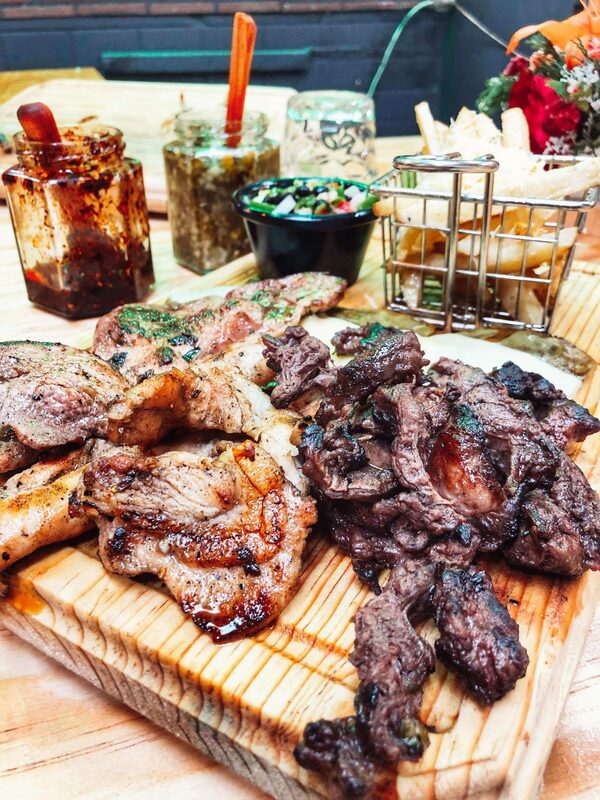 Looking for other great things to do in Mexico City? Click here to check out my guide! Our tour began with a stop at a seafood restaurant that has been open since 1974. 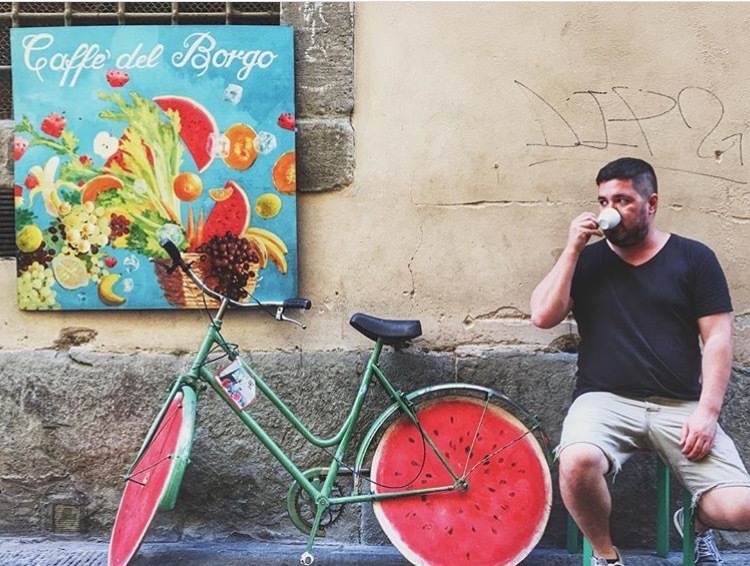 The venue started as a street food stall, but it has since become so popular that you can now find multiple locations throughout the city. Adrian told us it had to be our first stop because, if we had tried coming later in the day, we wouldn’t have been able to get a table. Apparently the place does everything seafood related really well, but we were there for the crunchy seafood tostadas. I chose to go with a shrimp tostada, as they were (sadly) out of octopus. After one bite, I could tell why this place is so popular. 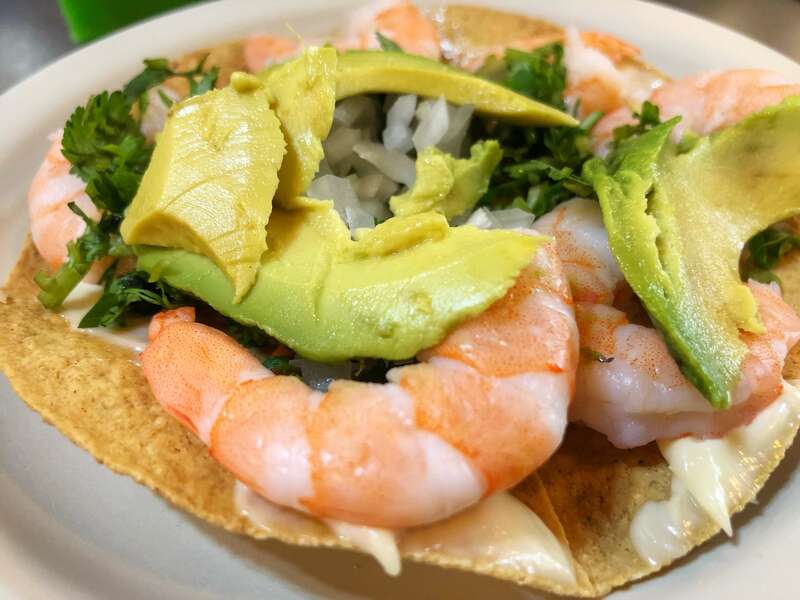 The shrimp were perfectly cooked, and I loved the crunch of the tostada with the different topping textures, including avocado and fresh onion. Of course, I added the obligatory spicy salsa and squeeze of lime to my dish. As we ate, we learned why the seafood was such high quality — Mexico City has the second largest seafood market in the world (the first is in Japan). Even though Mexico City is not on the coast, much of the country’s seafood is processed here in the capital city before distribution. This means Mexico City restaurants get first dibs on seafood. After this first stop, I quickly realized I would need to pace myself on this trip. Adrian promised we had a full day of eating ahead of us, so I held off, even though I could have easily gone for a second tostada. Next up, we tried a very local drink — pulque. I say very local because pulque is not readily available outside of Mexico. Due to its production process, it spoils within a few days. 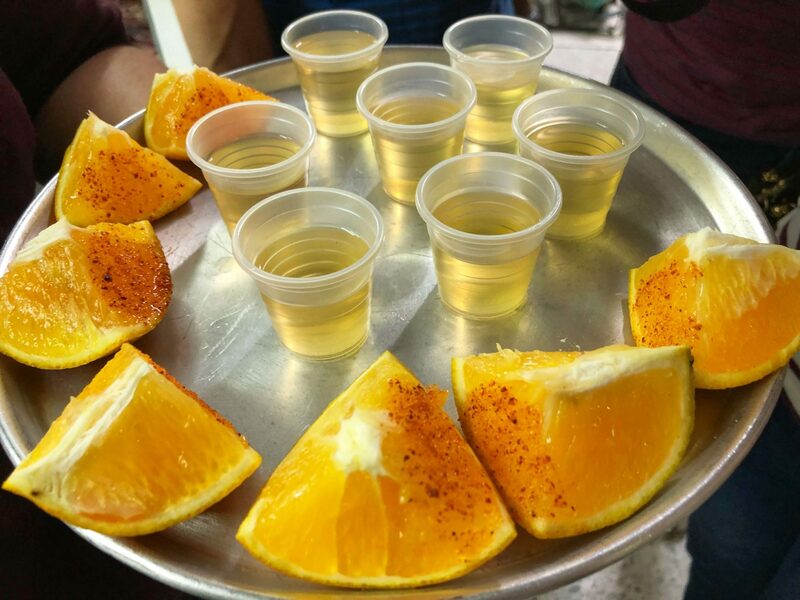 Like tequila and mezcal, pulque is made of agave, but it is fermented rather than distilled. You would need to drink quite a bit of it to get drunk — pulque has a maximum 6% alcohol volume. It is, however, full of probiotics, so you can catch a buzz off something that’s actually good for you! Pulque is not a new drink. In ancient times it was a sacred ritual drink consumed to connect with the gods. However, pulque has seen a reemergence in popularity (and has now become borderline hipsterish). 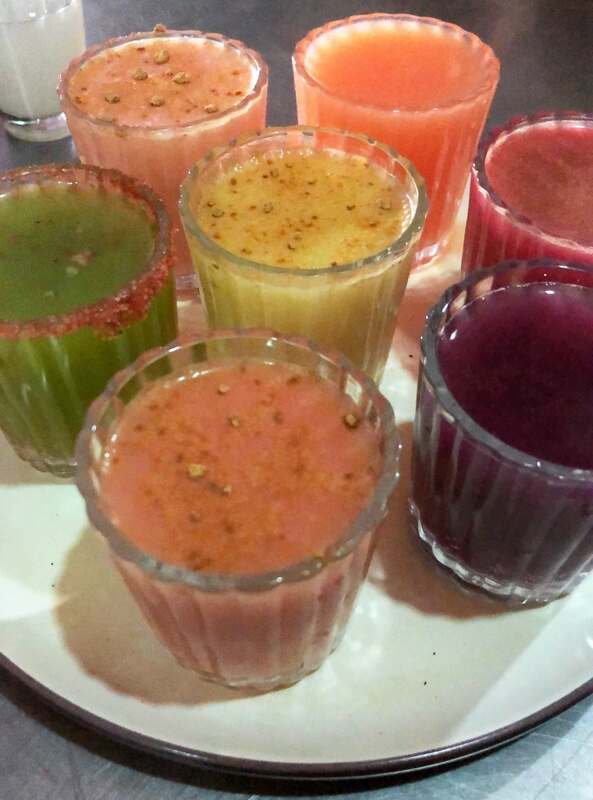 We tried pulque at a local pulqueria that literally serves nothing but the stuff — not even water. Fortunately, they did offer a variety of pulques, as I didn’t really care for the original version. It tasted too fermented, a lot like kombucha, and the viscous consistency is more evident without the benefit of added flavors. I did really like the flavored versions — especially the cinnamon sprinkled strawberry variety. Next we arrived at the Mercado de San Juan. At first it felt like a typical market scene — busy, crowded, vendors chatting with shoppers as they bagged up orders and collected money. It was only when I took a closer look at what was being bought and sold that I realized this market wasn’t typical at all. One of the first things we saw were row after row of bugs for sale. We tried crickets in salt and lime and grasshoppers in garlic and olive oil. 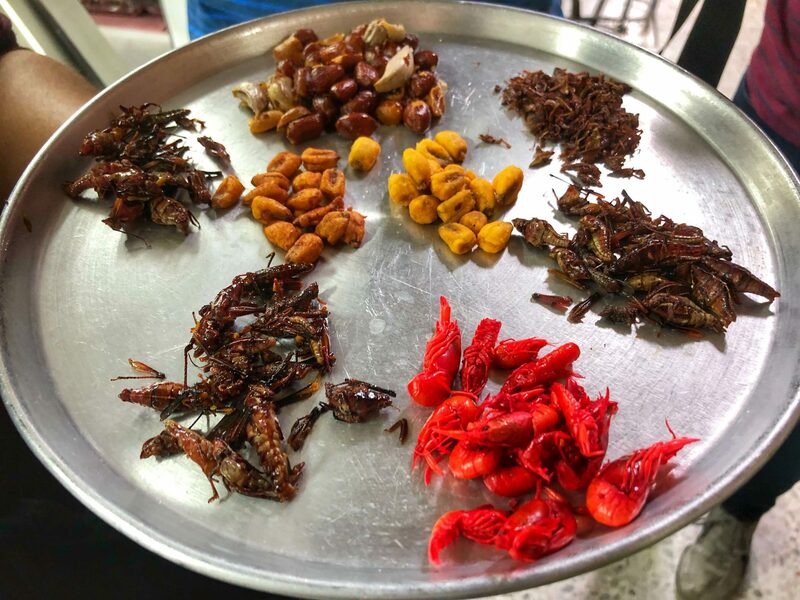 These weren’t actually all that bad, but I didn’t care for the dried crayfish at all. I’ve had mezcal before and knew that I liked it. But this time we learned the proper way to drink it, and I have to admit that I appreciate it more now than I did before. As we walked along, Adrian explained the market to us. 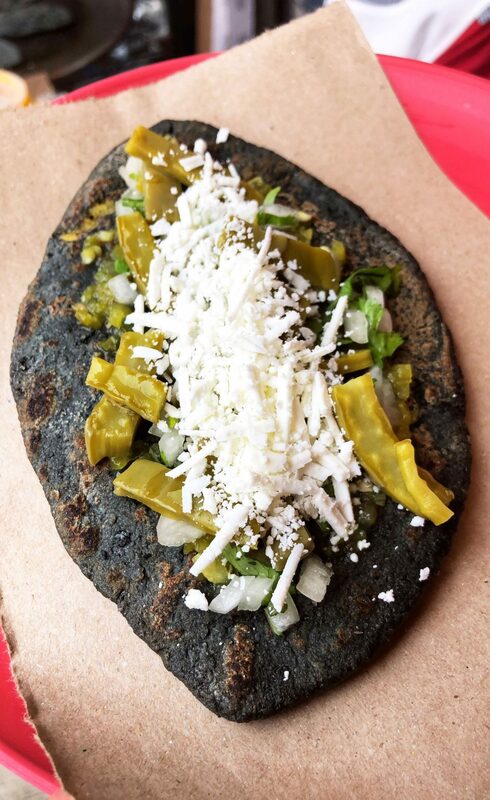 When the Spanish settlers came to Mexico City, they missed their favorite foods from home. To meet this need, the market began importing jamon and aged cheeses, foods considered exotic at the time. 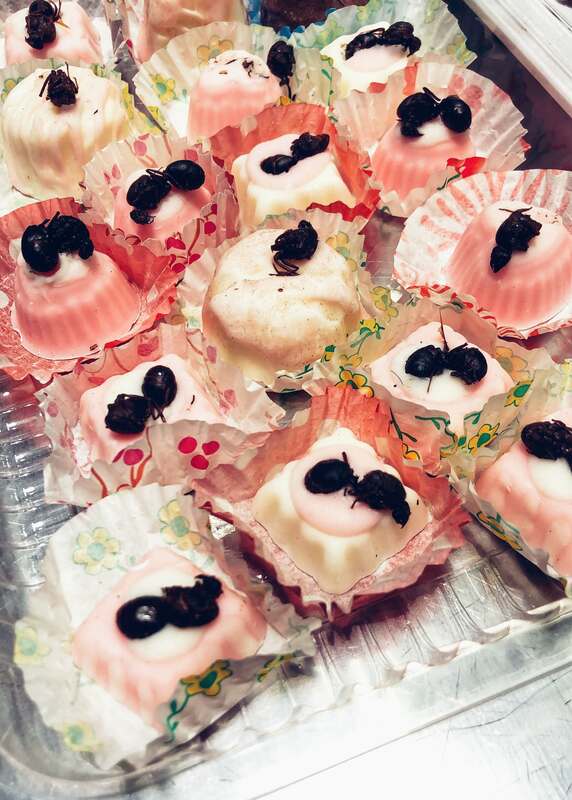 The vendors noticed their customers were responding well to exotic offerings and began importing more products from around the world, getting more and more unique as the market expanded. The high quality and unique items for sale at the San Juan market have made it the preferred chef’s market. 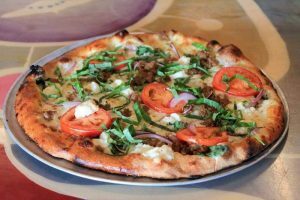 You can often find some of the best chefs in the city among the crowd, selecting items that will end up on their menus. 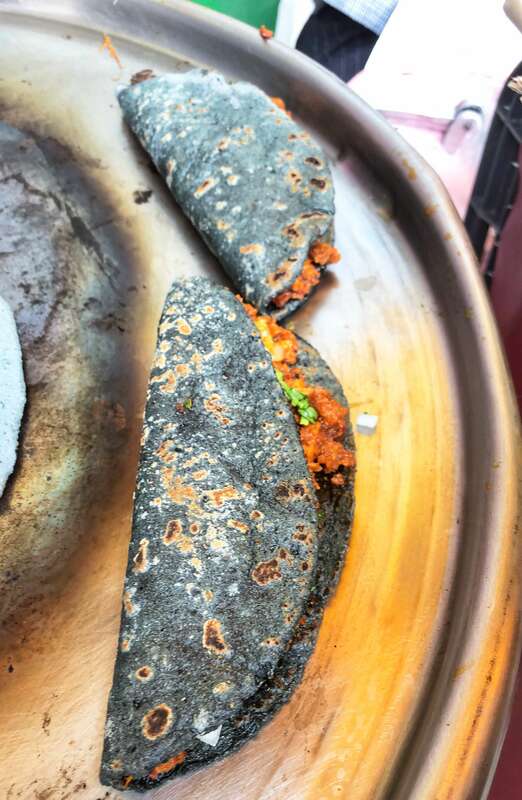 The lady selling them expertly filled the masa and then tossed it on the pan to put a perfect char on the outside. When it was finished I topped mine with cactus, onion, salsa and cheese and enjoyed it as we stood on the street. This simple dish was easily my favorite of the day — I loved the char on the masa and the consistency of the beans. This dish is sold all over the city, but this is the best version I’ve ever tried. 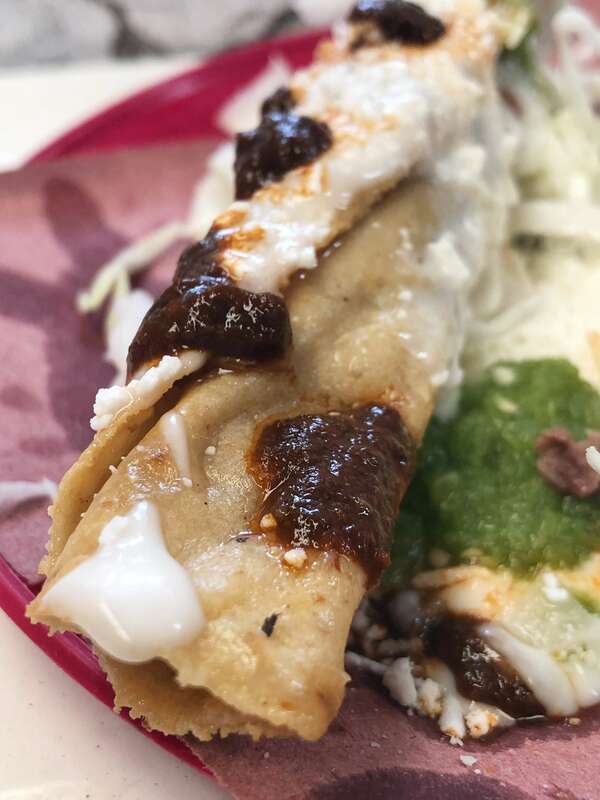 Next we passed through a second market to try flautas, deep-fried stuffed tacos the size and shape of flutes. These were really good, if not a bit greasy/heavy. I can see how they make for a great hangover food. Our last stop of the day ensured we didn’t go home hungry (as if that would have even been a problem). This stand proclaims to have the best tacos in all of Mexico City. I’m not sure if that’s true, but judging by their line down the sidewalk, there are certainly quite a few who agree. 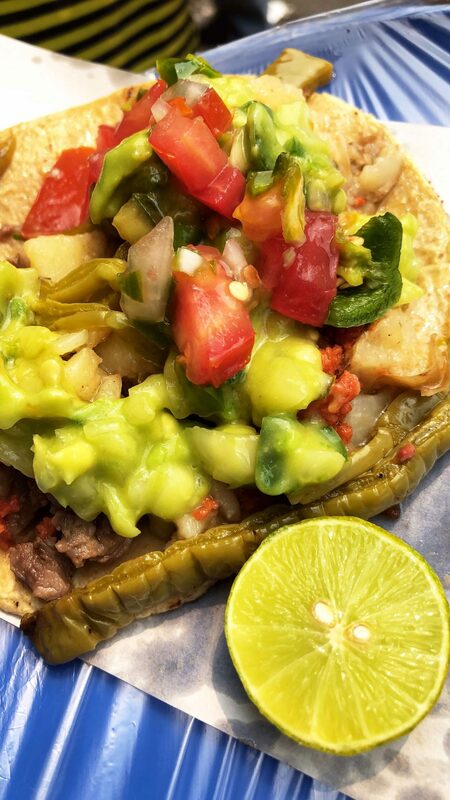 These are known as Campechano tacos — half beef steak and half chorizo. As soon as the vendor passes you your tacos, make your way to the condiment bar and customize your selection with salsa and lime. 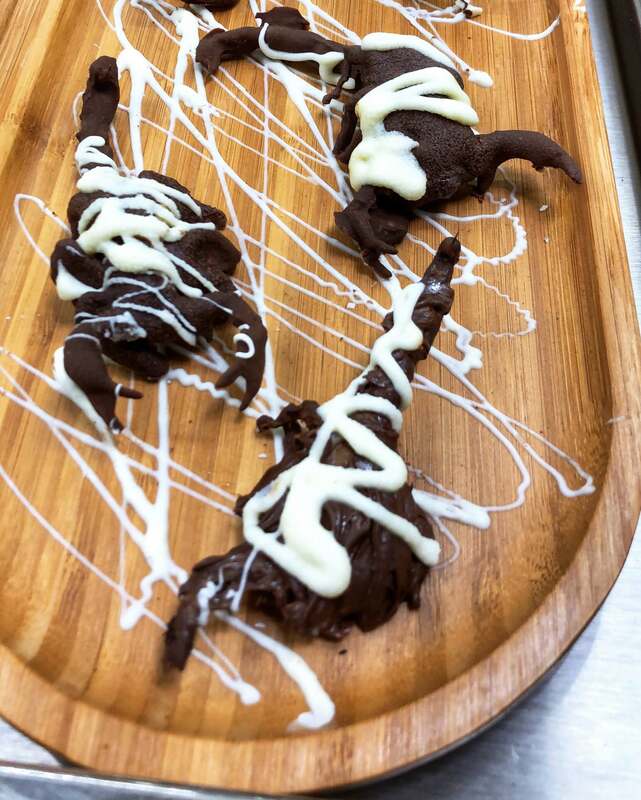 These were as delicious as they were messy! Stuffed and staving off food comas, we said our goodbyes and made peace with the fact that we wouldn’t be eating again for the rest of the day! Would you consider visiting Mercado de San Juan yourself? Which stop looked best to you? Let me know in the comments section below! 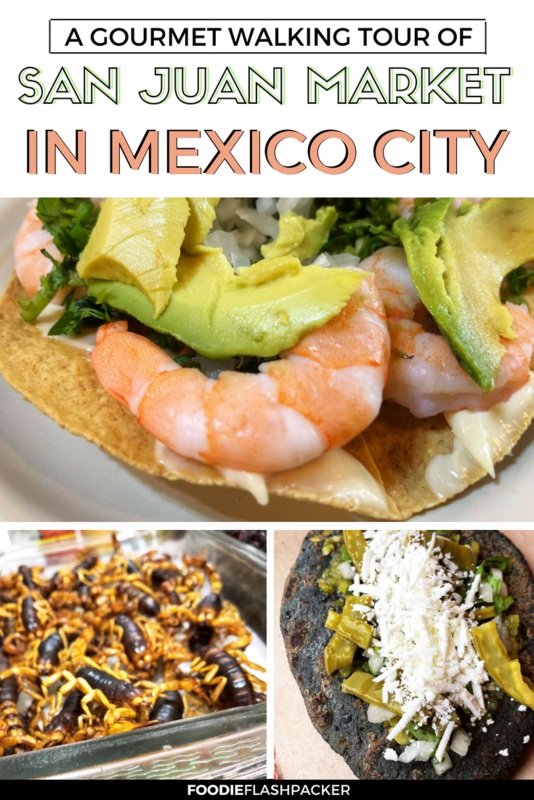 Practical Information: I promised Eat Mexico I wouldn’t reveal all of the stops on the tour to leave some surprises for when you book your own tour, but these were definitely some of my favorites. To book this tour for yourself, visit their site here. You can also find them on Facebook and Instagram. Disclaimer: I would like to thank Eat Mexico for having me as their guest during this visit. All opinions remain my own, as usual.